LaToya has been dancing for over 20 years. Originally from Utica, NY, she is trained in various dance techniques and grew up as a competitive dancer. She is a graduate from Manhattanville College in Purchase, NY with a Bachelor’s degree in Communications and Dance and Theatre. 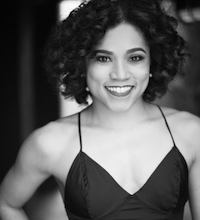 During her college career she had the opportunity to work with guest choreographers such as Darrah Carr, Earl Frederick Mosley and Ronald K. Brown from the Alvin Ailey Dance Theatre. LaToya’s professional credits include: Motion picture TRAINWRECK 2015, Knicks City Dancer 2009-2015; being captain for the last two, Assistant Coach of the Knicks City Kids, Coach of the Timeless Torches dance team for the WNBA Liberty, NBA All-Star basketball games in Los Angeles, Orlando, New Orleans and New York, Pre-Olympic Tour held in Manchester, England 2012. LaToya has danced with artists Rihanna, Nicki Minaj, Lenny Kravitz, Flo Rida, Pitbull, Ne-yo, Jason Derulo, Labyrinth, Natasha Mosley, Vanilla Ice and Mack Wilds. In addition to live performances, LaToya has also performed on television shows such as Saturday Night Live, Late night with Jimmy Fallon and The View. She has had the opportunity to dance in various countries including Italy, France, Spain, Germany and China.